How cute is she? I puppy-sat for Haley this weekend, and let me tell you, it is hard knitting while trying to occupy a 7 1/2 week old puppy! 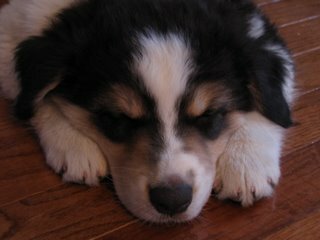 She is one of the latest litter by my friend Terri's boy Razz. She is so full of herself, and has got quite the little attitude already! She is going to make one great agility and show dog! I did manage to get one wristwarmer done and am about 2" into the second one. I also ripped out the hood of Outback and just did a ribbed neckline. Pics to come after a blocking. 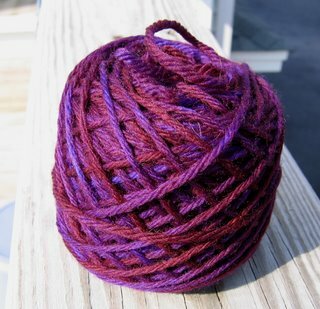 I got more of the purple yarn dyed. It came out very pretty. 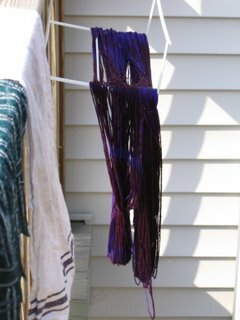 It was soooooooo beautiful out on Saturday - temps in the 50's and dare I say 60's - I ended up falling asleep out on the deck in the sun while the yarn dried. The plant box hanger makes a great yarn drier too! I also put a bunch of stuff over on the sale/swap page - check it out!